Lava Mobile has this week added a new addition to their range of ETAB series Android tablets, in the form of the newly launched Lava E-Tab Connect 3G Android Tablet. The newly launched Lava E-Tab Connect 3G tablet features a 7 inch WVGS resolution screen, and comes supplied running Google’s Android 4.0 Ice Cream Sandwich (ICS) operating system. The Lava E-Tab Connect 3G Android tablet is powered by a 1 GHz Qualcomm Snapdragon processor supported by supported by 512MB of RAM, with 4Gb of internal storage available, with a SD card slot offering a possible additional 32GB of storage when required. 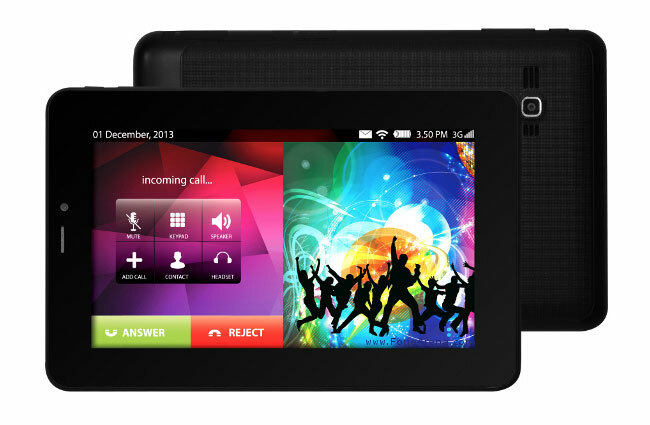 The Lava E-Tab Connect 3G support GSM 900/1800 MHz networks together with WCDMA 2100 MHz networks, and measures 194 x 123.3 x 9.8 mm in size, with VGA front facing camera for video calling, together with a 2 megapixel rear facing camera. The Lava E-Tab Connect 3G Android tablet is now available for Rs. 9,499.